Not Included: Entrance fees to site you decide to enter. 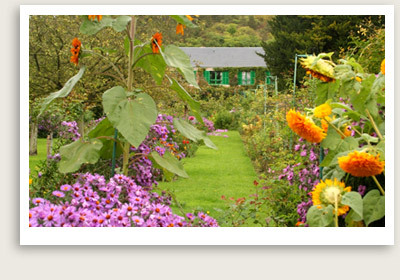 This day trip from Paris begins with a private tour of Giverny, where you will get an introduction to the life and work of impressionist painter Claude Monet. You will have a guided tour of Monet’s house and workshop, the formal enclosed Norman Garden, and the romantic Water Garden with the Pond and Japanese Bridge. You will also enjoy a visit to the Museum of American Art. Afterwards, you will enjoy a panoramic driving tour through Routes des Cretes of the Seine Valley. Here you will stop for a visit to an incredible 10th century watchtower and the village and chateau of la Roche Guyon. You will also visit Château-Gaillard, an old medieval castle that was the stronghold for Richard the Lionheart. Next, your Paris day trip takes you to Rouen, the capital of Upper Normandy since Roman times. Your guide will take you on a stroll through the medieval town. Here you will get a close look such monuments as the House of the Exchequer, the 15th century Archbishop Palace, and the Renaissance Palace of Justice. You will also stop for a photo of Rouen’s most popular monument: the Grosse Horloge, a 16th century clock with a dome-crowned belfry. You will stop at the Place du Vieux Marché (Old Market Square), where Joan of Arc was burned at the stake. Finally you will visit of the Notre Dame de Rouen Cathedral, one of the most beautiful examples of French Gothic, immortalized over 20 times by Claude Monet.